As always, at Manhattan Orthopedic Care we are proud to hear a good praise from our patients. It’s our policy to cater to our patient’s every need; and more importantly, healthy again. 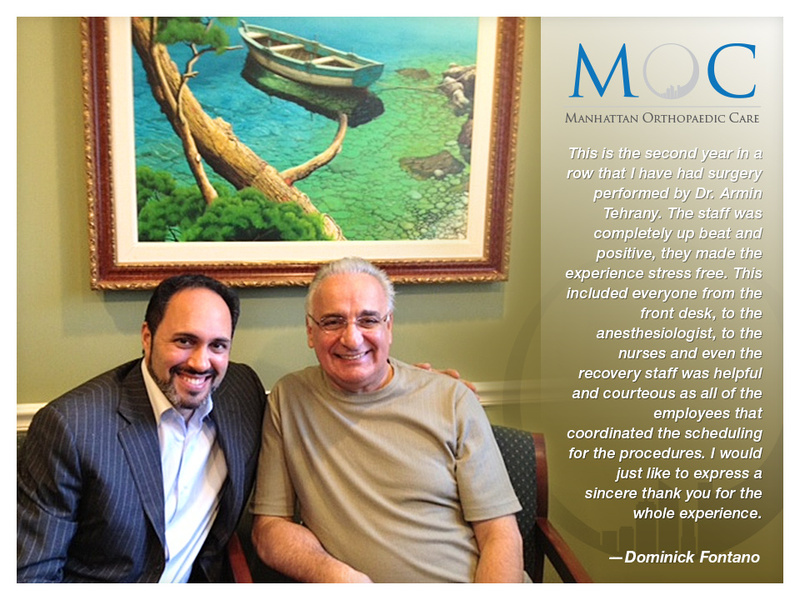 Dominick Fontano, who visited MOC for the second year in a row for a knee surgery on both his knees, was not only satisfied with Dr. Armin Tehrany’s work and care, but he also spread his compliments towards the staff who made his experience stress-free. “I want to express my gratitude and satisfaction with your office and staff at the Care One facility. This is the second year in a row that I have had surgery performed by Dr. Tehrany, on first my right knee and now my left and I am again completely satisfied. The staff, like Zoe who was completely up beat and positive made the experience stress free. This included everyone from the front desk person, to the anesthesiologist, to the nurses and even the recovery staff was helpful and courteous as all of the employees that coordinated the scheduling for the procedures. I would just like to express a sincere thank you for the whole experience.”, wrote Mr. Fontano is his patient testimonial. Thank you, Mr. Fontano, for this wonderful testimonial.